Bea Miller and Hayley Erbert hit the black carpet at the Childhelp Hollywood Heroes event this week in Beverly Hills, Calif. The singer and Dancing With The Stars troupe dancer stepped out for the event that is dedicated to the treatment and prevention of child abuse. Bea was the special guest performer for the event. Max Ehrich, Roshon Fegan and Dytto were also at the event. Child abuse is reported every 10 seconds in the U.S., and it’s reported that over 10 million kids saved through nearly 60 years of Childhelp programs and services. 20+ pics inside of Hayley Erbert, Bea Miller, and more. Bella Thorne is a little camera shy as she and Max Ehrich head to lunch on Saturday afternoon (July 22) in Los Angeles. The 19-year-old entertainer showed off her super bright, pink hair while Max put his buff biceps on full display in a tank shirt. For the past few weeks, Max has been teasing his upcoming music collaboration with Bella. So far, all we know about the song is that producer Ari Blitz is working on it with them and we bet it’s going to be a major hit! It looks like Max Ehrich and Bella Thorne are working on new music together — and you better believe that it’s going to be a hot summer track! The song is definitely a work in progress. Bella and Max have been working together for a while, making the track perfect. They’re also working with producer Ari Blitz on their music. Max, Bella and Ari have all shared pics from their jam sessions, usually with an ominous caption like “coming soon” and “you’ll know soon”. Word on the street is that we might get as soon as this fall…but we’ll be crossing our fingers for even sooner. Check back later for even more scoop on Max and Bella‘s collab! 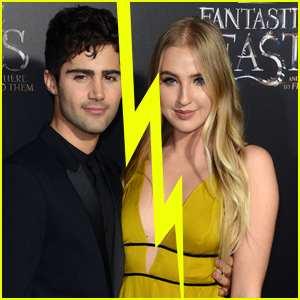 Veronica Dunne and Max Ehrich have ended their relationship, JustJaredJr.com can confirm. The news come just after Max tweeted the message “I am single,” letting fans know that the longtime couple wasn’t together anymore. Max and Veronica‘s split comes just after the couple celebrated their three year anniversary late last month. At the time, they recorded a beautiful cover together that you can still watch on JJJ. Max is keeping busy with new music and is about to drop a song with Bella Thorne. Stay tuned for exclusive details! 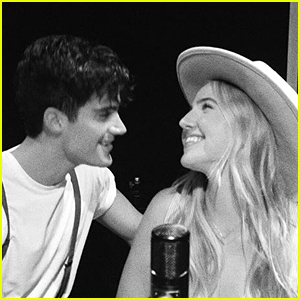 Veronica Dunne and Max Ehrich are pretty much the couple everyone wants to be and there’s good reason for that — they’re so good together! The K.C. Undercover star and her actor/singer boyfriend are celebrating their three year anniversary today and decided to put together a cute cover to celebrate it. “We sing together daily and felt like we wanted to share one of our favorite songs on this special day — ‘You & I’ by the incredible Ingrid Michaelson,” the couple tells JJJ. And the key to lasting this long in a world filled with constant breakups? “Patience, compassion and lots of humor,” Veronica says.